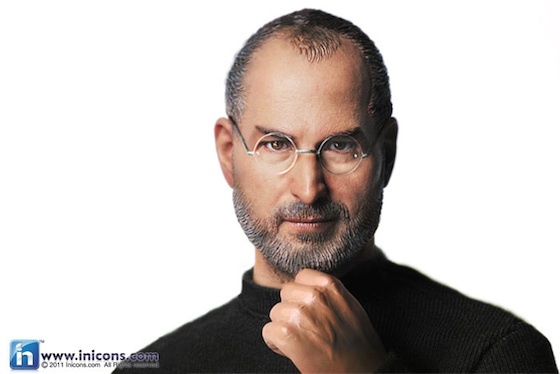 The Telegraph reports that Apple has threatened legal action against Hong Kong company In Icons, which has been taking pre-orders for a realistic-looking Steve Jobs figurine set to launch next month. 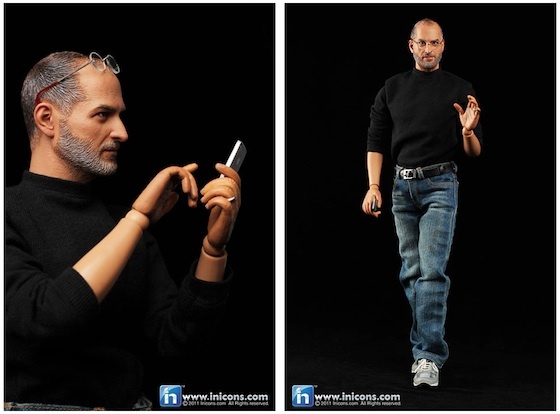 The 12-inch figurine, which is being sold for $99.99 plus shipping, is a posable, highly-detailed reproduction of Jobs' likeness wearing his signature black mock turtleneck, blue jeans, and New Balance sneakers. Apple reportedly stipulates in a letter to the Chinese manufacturer that any toy that resembles the technology company's logo, person's name, appearance or likeness of its products is a criminal offense. Personality rights in the United States are addressed on a state-by-state basis, with California's laws covering unauthorized usage of a person's likeness, voice, or signature throughout their lifetime and for a period of 70 years following their death. I'm no lawyer. But I can't see how Apple can claim to "Own" the likeness of it's sadly deceased founder. Tasteless? for sure, but if people buy it, then I guess that's life. Personally, I wouldn't touch it with a barge pole....Kind of creepy. Wow from the corner of my eye I thought I was looking at the front cover of the bio. Looks amazing, but too creepy to buy. Hes holding the phone wrong! Actually who does own his image rights? Actors have control over use of their names and image, so wouldn't Steve Jobs estate own his? Not as ridiculous as spelling the word "rediculous". Any company that doesn't aggressively attempt to protect its IP risks losing it. So, Apple are now claiming to own Steve Jobs' face? Relax Apple... its not that big a deal. Personality rights in the United States are addressed on a state-by-state basis, with California's laws (http://leginfo.ca.gov/cgi-bin/displaycode?section=civ&group=03001-04000&file=3344-3346) covering unauthorized usage of a person's likeness, voice, or signature throughout their lifetime and for a period of 70 years following their death. Does this mean that it cannot be sold in the State of California? I don't believe California law applies outside California. Either way, the wrists of the SJ doll look messed up. Even the cheapest Barbie doll rip off has much nicer jointing points. I have to agree. I don't claim to be an expert of CEO-Corporation law, but it seems really weird that a company would have the rights to have any say on this matter. I mean, Steve was also a board member of Disney... What is Disney was in favor of the figurine? Really, this kind of thing should be in the realm of Steve's estate (i.e. his family). They should have the say on whether or not the figure goes forward or not, and they should get a cut of the profits if it does. For all we know, the family could be asking Apple to do this.